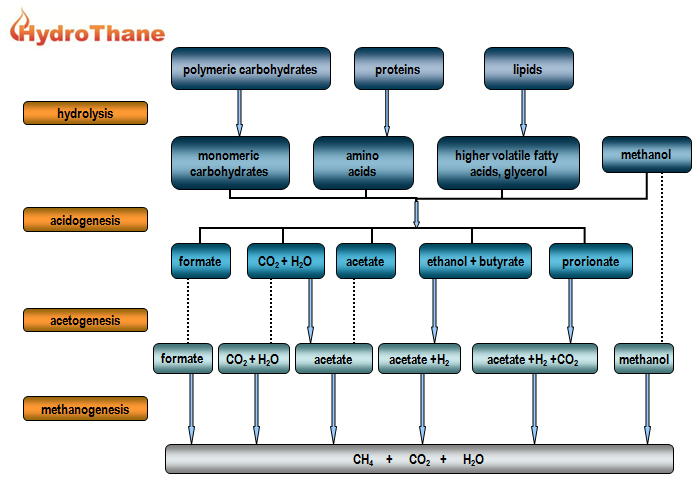 Anaerobic treatment of waste (water) is a biological method characterized by the production of methane (CH4). All the active micro-organisms belong to the group of anaerobic bacteria, i.e. bacteria which are able to and in most cases can only exist in an environment which excludes oxygen. In this context, methanogenic bacteria are a key component. The anaerobic degradation process of organic material occurs stepwise. The anaerobic process removes the bulk of COD (Chemical Oxygen Demand) from the waste (water) by converting it into biogas (= methane + carbon dioxide) at low operational costs.